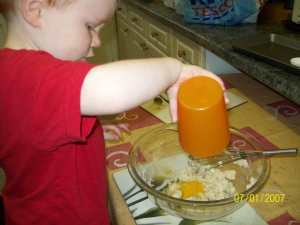 These kids cooking recipes are great for starting out with. You will be aware as to what your children are capable of doing at what age. I have had toddlers cracking eggs, mixing and peeling and cutting up, they have thoroughly enjoyed this but I have needed to be vigilant and present with them. Take 4 six eggs in a glass bowl. Cover them with boiling water from the kettle. Pop a cover on and let the eggs stand where they will keep hot, but not cook, for 10 minutes. If you like your eggs well done leave them for 12 minutes. They should be perfect, soft and creamy all the way through. Place 4 eggs in a saucepan of cold water on the cooker. Remove the eggs from the water the minute the water boils and they will be just done. Break the eggs into a bowl and mix with a fork until well broken up and mixed. Add to this the milk and salt. In a frying pan melt the butter; when it melts, shake it well from side to side, till all the bottom of the pan is covered. Cook the onion in the butter until it is soft, it will take a few minutes. Pour the eggs into the frying pan and stir them using a plastic spatula or wooden spoon. Keep moving the egg around to stop it sticking to the bottom of the pan. When the eggs start to become firmer add the parsley, take the frying pan off the heat, and keep stirring the eggs. until they are creamy and firm, but not hard. Serve on toast or with bread and butter. Wash and dry your potatoes, prick the skins with a fork to prevent splitting skins. Bake in a hot oven for around an hour, if potato is cooked you should be able to press the potato and have it feel soft. Hold each potato in a towel, and cut it in two, lengthwise. Scoop out the inside of the potato with a spoon into a hot bowl. Once all the potatoes are scooped out into the bowl add salt, butter and cheese. Scoop the potato back into the potato shells, heaping them full. 4	thin slices of cheese. 1	pinch of cayenne pepper, and salt for each slice. Place in the sandwiches and when one side is brown turn the sandwich over and brown the other side. 1/2	cup of cold chicken, cut in small bits. 1/2	a hard boiled egg, cut up. Place dressing into a small clean jar with a lid and shake well to combine the ingredients. 1	rounded tablespoonful of butter. 1	rounded tablespoonful of flour. Peel and cut the potatoes into bits the size of the end of your thumb. Bring the milk to the boil then put the potatoes on a low heat to cook while you make the white sauce. When the potatoes are cooked, (they will feel soft when you put a fork in them) drain them. Add potatoes into the thin white sauce, stir gently then add pepper. For thin sauce cook for only one minute, for thick sauce cook for two minutes. 1	small cup of sugar. Prepare your fruit nicely; strawberries must be washed and hulled. Press and stir fruit till it is all wet and juicy. Gently boil fruit, stir the fruit constantly from the bottom up, so the fruit will not burn. Mash with a potato masher till all of the fruit is smooth. When jam has cooked for nearly an hour, try a little on a cold saucer and see if it gets firm. If you push in the edge of the jam on the plate gently the jam should wrinkle. When it does, it is done. If it is not done just cook longer and try again. Some jams take longer to cook than others, because some fruits are more juicy. Peel and core a large cooking apple. Fill the center with sugar, and just cover the bottom of the dish with water. Bake in a hot oven till soft, with a spoon pour the juice over the apple every five minutes or so (basting)until apple is soft when you push a fork into it. Put the milk in a saucepan and on the cooker to heat. Seperate the eggs, then beat the yolks of the eggs, add the sugar and beat again. Pour the hot milk into the egg yolks and sugar, add the salt and stir till the custard becomes thick like cream. Take the custard off the heat at once; be careful not to let it boil at all or it will be spoiled. Eat with the apple hot or place it into a glass and place in fridge to become cool. 1/2 teaspoonful of salt. 3 shakes of pepper. Mix all of the ingredients together in a large bowl together. Melt a tablespoonful of butter and when it bubbles shake it all around the pan. Put in the hash and cook it till dry, stirring it often and scraping it from the bottom of the pan. When none of the soup or water runs out when you lift a spoonful, and when it seems steaming hot, it can be served. Cut sandwiches in quarters and serve straight away. Sieve together into a large bowl the flour, baking powder, salt and sugar. Add the milk to the peanut butter and blend well. Add the peanut butter mixture to the flour mixture and mix thoroughly. Pour mixture into a greased loaf pan in slow oven 45 to 50 minutes. This bread tastes best when a day old. Melt the chocolate in a bowl in the microwave. In a large bowl pour in the sugar and add the butter chopped. Break in the egg and then mix the sugar butter and egg well until you have a creamy mixture. sieve the flour and baking powder together into a smaller bowl. Add the milk slowly to the butter and sugar mixture stirring it all the time and adding the flour a little at a time. Stir in the melted chocolate and the vanilla, beat the mixture hard with a wooden spoon. Bake in oven at 350°F. for 23 to 27 minutes or until toothpick inserted in center comes out clean.